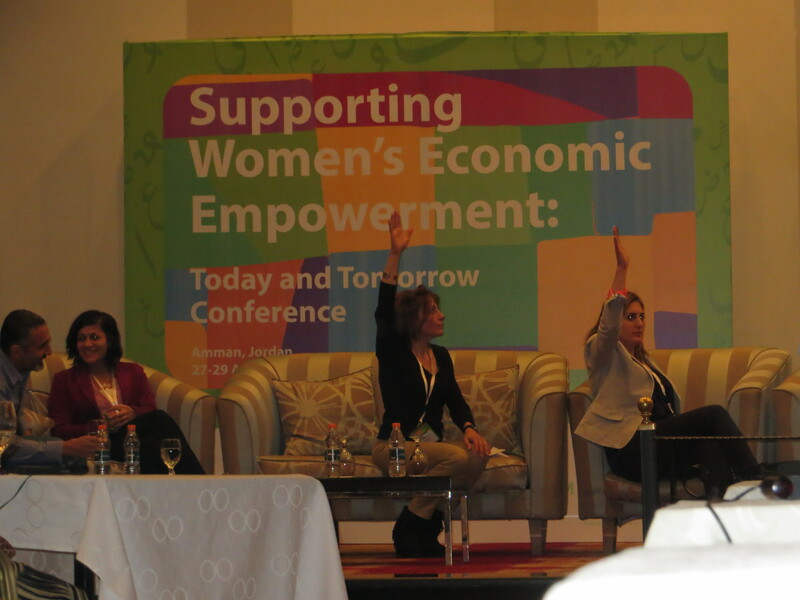 Last month I was invited to speak at a conference on Supporting Women’s Economic Empowerment in Amman, Jordan. 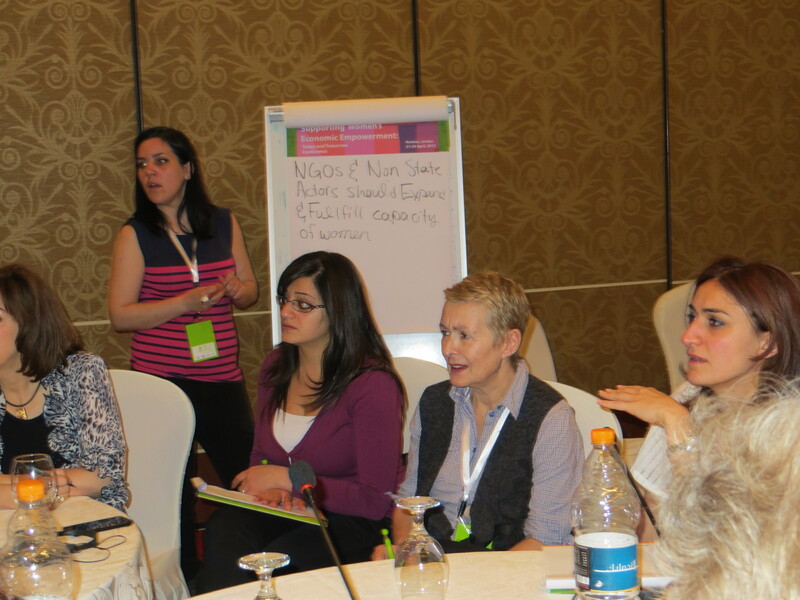 Sponsored by Oxfam-Quebec, the conference focused on women in the Middle East and North Africa (MENA). They asked me to speak about what unions can do for women in the region, and what obstacles they might face. But I have to admit, the invitation seemed to come out of the blue. I had never worked with Oxfam, or done work in the region. So, I felt very fortunate to be included, like being granted a wish you didn’t even know you had. In Jordan, women’s earned income is 21% of men’s. In the US, it’s about 80%. 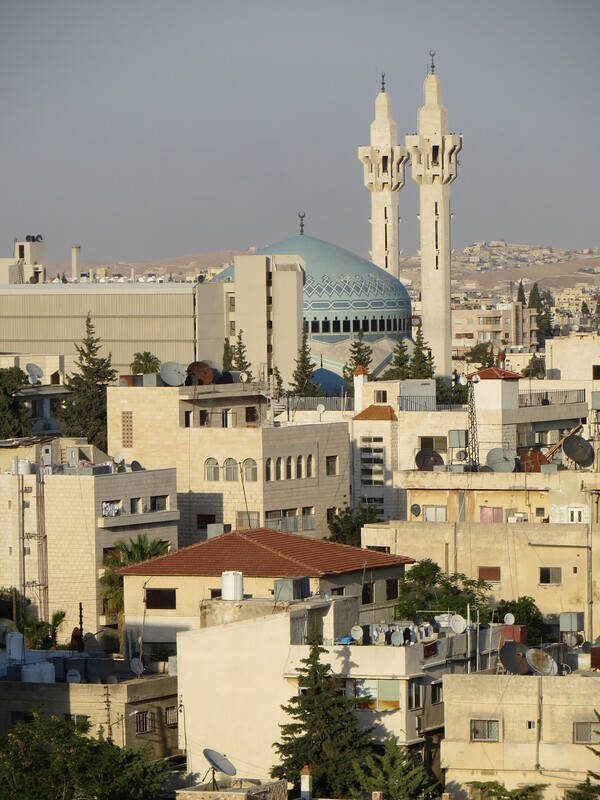 Women in Jordan face challenges in the right to inherit property and to own land. Among Syrian refuge families in Jordan that are headed by women, 55% have zero income, and rely entirely on charity. The conference was organized around three tracks, and I was in the one that focused on women’s inclusion and participation in decision-making. The very first session in our track involved a heated debate about how to advance women’s empowerment in a part of the world that is deeply religious, and where the dominant religion currently proscribes strict gender roles that limit women’s economic independence. The debate went something like this. Statement: Women’s rights are universal human rights. Women deserve economic empowerment (and other rights). No further justification is needed. International agreements, like CEDAW (the Convention on Elimination of All Forms of Discrimination Against Women) help establish these rights. (Note: The U.S. has signed, but not ratified, CEDAW). Response: While women’s rights may be a human rights issue, many people in the region will not be convinced by that argument, and may even reject it as being promoted by secularist or anti-religious outsiders. Instead, the practical approach is to find some doctrine within Islam that sends a positive message about women’s economic rights, or to find sympathetic imams to send a similar message. This option was initially put forth, sort of, by Dr. Mosleh Basmah Omair, a Saudi national with a Ph.D. from American University in Washington. She argued that the Prophet’s first wife, Khadijah Bint Khowalid, was a businesswoman and can serve as a role model for women today. She said this provides justification for women to run their own businesses and to work outside the home. She also pointed to the example of child care, saying that western women who say that Saudi women needed to have access to child care were mistaken. Why? Because there is no public transportation in Saudi Arabia, and women aren’t allowed to drive there, so they couldn’t get to or from a place that provides childcare. Her implication was, why bother? Hearing Dr. Omair talk, and hearing the heated response from other women from the region drove home for me the differences between the countries and cultures in the region. Many women objected to what she said, but one of the men in the audience suggested that we should not transgress against religion. He said that the Islamic religion has given women rights that will be enough for her. Counter-response: Another woman from Chad responded that for 10 years, activists in her country had tried to find justifications for women’s empowerment within Islam, but it didn’t really work. In her view, this is ultimately a losing strategy. Yet I also think that when it comes to religion, people who are outside the power structure of that religion have absolutely no credibility. So, as another conference participant (a Jordanian, raised Christian) described it to me, if a woman really believes she will go to hell for all eternity if she works outside the home (or otherwise acted independent), why would she believe a secularist who talks about human rights? The secularist is likely to be a heathen of some sort – who probably doesn’t even believe hell exists – and their word cannot be trusted. This reminds me of the old saying in organizational development and other kinds of change work: You start with people where they are. Which, in this case, suggests starting with an Islamic justification for women’s economic rights. And I say this being entirely uncomfortable with the notion that women’s rights in political Islamic countries depend on things like finding sympathetic imams. Even though there may be a number of them, it takes control of the issue away from women and puts it in the hands of other people. And, as sympathetic as those people might be, they might be sidelined if they challenge the status quo too much – much like Catholic bishops in the US who try to take action against priests who abuse children. 1. Is it Spring for Arab Women? Many women reported that there has been a retrenchment in women’s rights since the events that we in the West refer to as the “Arab Spring”. At first, women were encouraged to participate in demonstrations and other events, because the movement needed large numbers. Since then, women have been pushed more to the background. 2. Where to look for a model of democracy? Some of the conference participants from the MENA region were particularly interested in talking to the women from the former Soviet Republics (particularly Lika Nadaraia, Women’s Political Resource Center, Georgia) about the transition to democracy and ways to maintain and improve women’s rights in that process. One speaker commented on the respective roles of religion in the movement to democracy in Eastern Europe and MENA. Thanks to the Solidarity Center (Mike Leslie, Francesca Ricciardone) for helping me get up to speed about unions in region. Francesca talked with me about the growth of independent unions in Jordan. (Most unions there are tightly connected to the government.) She also put me in touch with Abla Masrujeh, a union leader in the West Bank who now works with the Solidarity Center. 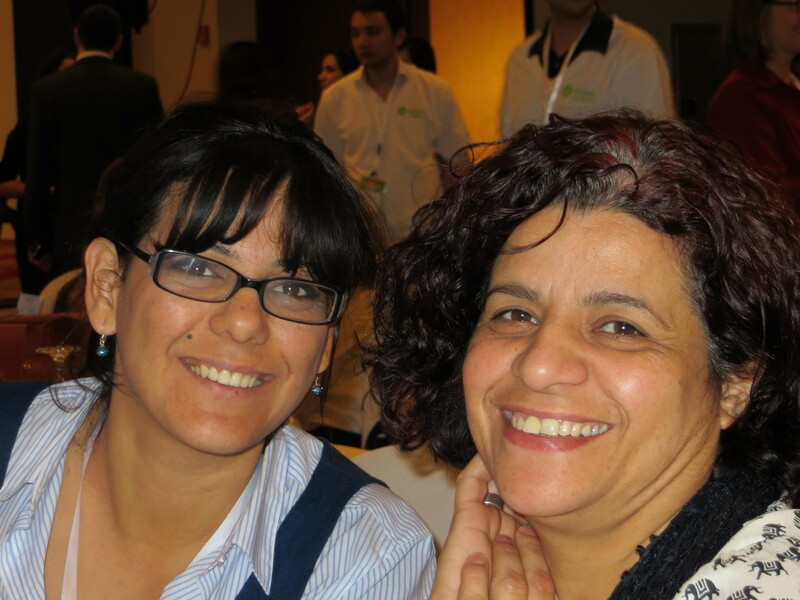 I had the chance to meet Abla and spend some time with her at the conference. Abla, Nadia Shabana from the ITUC, and I seemed to make up the entire labor caucus in the conference of about 175 participants. Of course, unions don’t have such a large presence in the region at this point. And one goal of the conference was to bring together people who don’t normally talk to each other. For me, this was definitely the case. I came away from the conference with new perspectives. The Palestinian view was well-represented at the conference. For U.S. readers, questions about Palestine may be even more controversial than the earlier comments about religion. Palestinian participants were vocal about the additional burden of living in an occupied land. One woman from Gaza, upon learning that I was from the US, really wanted me to know what conditions were like there, including having no electricity for days at a time. They need to change laws, including labor laws. Because those changes might be rejected by women, they also need to work with women in ways that empower them. But they can’t focus on empowering women alone. They need to empower women, children, and men. There needs to be a balanced society with real partnerships. And they also have to keep some traditions in place, in order to resist the occupation of Palestine. Some of the traditions create community and solidarity and help them to stand together. She didn’t expand on that third point, but I wanted to know more, because some traditions limit women while others empower them. This was one of the few ways in which my perspectives as a U.S. based feminist and trade unionist seemed different than most of the rest of the participants in this conference. In my experience, most men in the labor movement will say they agree that women deserve equal economic rights. For some it might just be lip service but there are others who genuinely are supportive and demonstrate it by their behavior. But almost none would disagree with the principle. But because obstacles to full equality remain, we have events for union women that train them in the skills they need to be leaders in the labor movement. These events are typically organized and led by women, while men sometimes play a supporting role. We tend to see it as a good thing that women have a separate place where they can take the lead. 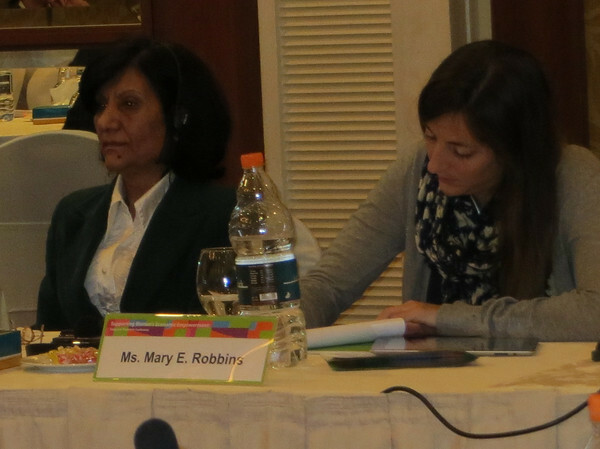 But women doing work in other parts of the world (e.g., Mary Robbins of PROMUNDO Brazil and Julie Théroux-Séguin of Oxfam-Quebec, working in Vietnam) talked about women’s empowerment in the household – who decides how money is spent for example. Théroux-Séguin reported that “big decisions” – whether or not to buy a house, where to send the kids to school – were entirely the domain of men. Women could make “small decisions – e.g., what to eat today. Some of the NGOs were doing projects with men and / or with couples to change these patterns. But Théroux-Séguin reported that when women became involved in “big decisions”, those topics were re-labeled as “small decisions”. On these kinds of projects, the NGOs were actively seeking to engage more men – if they didn’t, how would things change? This was a real contrast to my experience of creating separate spaces for women to advance their rights. I came away thinking that what they’re doing fits their context, and what we’re doing fits ours. Did you notice how in the debate I described above, some people did not consider women’s rights as human rights? Doesn’t sound a bit like the challenge in recent years to consider workers’ rights as human rights? Funny isn’t it – the vast majority of humans I’ve met in my life either are, were, or will be workers. And half of them are women. So, if human rights don’t apply to women or to workers, just who do they apply to? 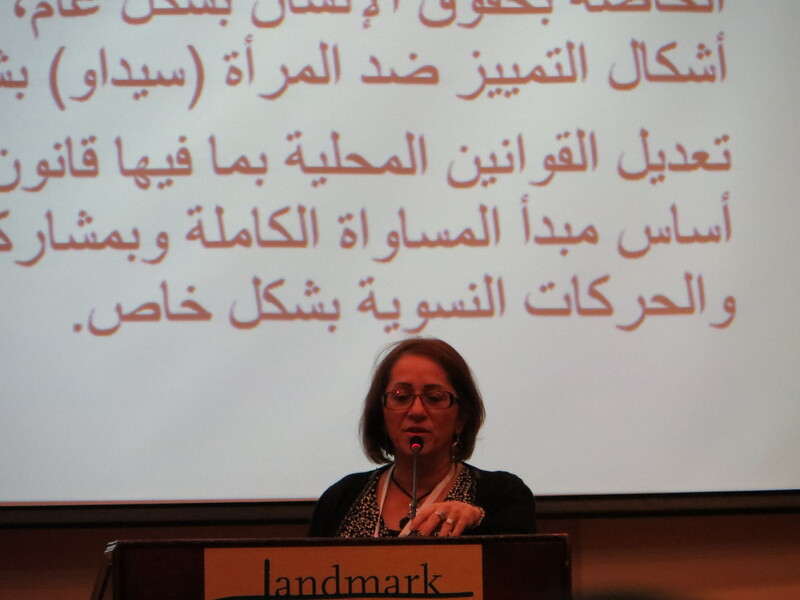 Sama Awadeh, director of the Women’s Studies Center, Palestine, talked about the difference between using the standard of equality or the standard of justice to promote women’s empowerment. And while there were, unfortunately, major problems with the translation equipment during her talk (simultaneous translation in 4 languages in each of 3 break-out rooms!) – I think she said that there is resistance to the principle of equality, because it suggests one group is taking something away from another group. On the other hand, who can be opposed to justice? So, she suggests that using a justice framework will lead to more gains for women. In Jordan, I was struck by how many people work in the informal economy, as sole proprietors, or for very small businesses. So much of our union experience is based on large employers. We need different forms of unionism to protect workers’ rights in this kind of an economy. 9. Enough of that serious stuff! Let’s dance! For more pictures of the conference, click here. After the conference I did some touring around Jordan, to Petra and the Dead Sea, among other locations. For those pictures, click here. The trip to Petra was a bit of a challenge. It’s about a 3- or 4- hour drive from where I was. The day before I was schedule to go, a clash between university students from two different tribes escalated to the point that 4 people died and 25 were hospitalized. The main road to Petra was closed as a result. Tensions continued for a few days; tear gas was used; a police officer was shot. It didn’t look like I was going to be able to get there. But finally, on my last day in Jordan, I was able to get a driver to take me to Petra via the secondary route over the mountains. It was well worth it. Thanks so much to Maryse Guimond, who was the driving force behind the conference, and to Elizabeth Ancil, who was my contact person at Oxfam-Quebec.